WASHINGTON (CNN) -- On a rainy evening in December in the upstate South Carolina town of Greer, as his once-languishing campaign was clawing its way back into contention, John McCain hosted a town hall meeting at a diner called Pete's Drive-In. 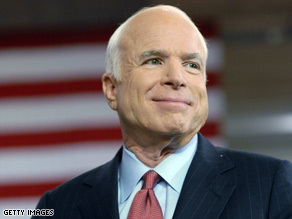 Sen. John McCain appears to have grown more comfortable when it comes to talking about his faith. He talked about the issues that usually stir his passions -- a commitment to service, winning the war in Iraq, fighting pork-barrel spending -- before taking questions from a small audience of Republican primary voters. As the event neared its conclusion, a man in the back of the restaurant raised his hand and broached a topic not often heard at the VFW and American Legion halls where McCain preferred to campaign. "I was wondering if you have accepted Jesus Christ as your Lord and savior," the voter said. McCain, positioned before a large American flag, paused and lowered his head. "I am a man of faith," he responded. "I have deep religious beliefs and values. I had experiences in my life where I had to rely on God not to get me through another day or another hour but another minute." The questioner, not satisfied, pressed the candidate again on whether he had let Christ into his life. See for yourself who the presidential candidates really are in back-to-back documentaries. "I also believe that talking too much about one's faith and religion, in my view, is something between me and God," McCain said. The crowd clapped. Rarely do the journalists and campaign staffers that travel with McCain hear him freely use such religious language, and if the senator is obliged to chat about faith, he usually appears genuinely eager to move on to something else, which made his self-assured performance at Saddleback all the more striking. Even religion-based GOP wedge issues like abortion and gay marriage, which should be home runs for McCain at town hall meetings, go unmentioned on the McCain road show, unless a voter brings them up. In the past, when matters of the divine were introduced, McCain handled the situation by carefully changing the subject or by simply shutting down the conversation. "I have attended North Phoenix Baptist Church for many years, and the most important thing is that I'm a Christian," he said several days later, adding curtly, "I don't have anything else to say about the issue." In a close election against Barack Obama, whose fluency in Bible verse has Democrats salivating over the prospect of swiping religious voters from GOP hands, McCain's reluctance to talk about God could be a liability. On multiple occasions Saturday, McCain responded to Warren's questions by citing his punishing five-year experience in a North Vietnamese prison. McCain recounted the tale of being offered early release by his captors and turning it down because of military code, a decision he knew would lead to brutal beatings and solitary confinement. "It took a lot of prayer," he told Warren. "It took a lot of prayer." He also told a story about one prison guard who quietly drew a cross in the sand in front of McCain one Christmas before quickly erasing it with his foot and moving on. "For a minute there, there was just two Christians, worshipping together," he said. McCain's campaign used the cross story in television ads and mailers that reached voters in late December, right around the time that Republican rival Mike Huckabee, known for his background as a Baptist preacher, debuted a Christmas advertisement appearing to show a white cross floating behind him. At the time, some critics questioned whether McCain was using the spot to pander to Christian conservatives in Iowa and South Carolina. But when McCain told the same story at Saddleback Church on Saturday, there was nothing but a gasp from the audience, followed by lengthy applause. Although talking about religious faith may not come easy to McCain, talking about faith in his country does. He might be starting to show that the two can be interwoven.